On our last feature in the DOTermination series, we bring you a most refreshing and inspiring jazz duo from Down Under. Meet Juliet Pang 冯欣慧 (a.k.a. Polkadot) and Didi Mudigdo (a.k.a. Moonbeam). Together, they are Polkadot +Moonbeam. Listen to this jazz duo and you will agree with me when I say that their sound evokes the timeless sweet charm of polka dots! DDoA: What brought you together? How did you find each other? Moonbeam: We met at a jazz open mic in Sydney in 2010. Polkadot was on a break in Sydney, and dropped in to sing a song on her last night in town before returning to Singapore. I happened to be the house pianist for this open mic. After exchanging details and getting to know each other over the internet, we realised we had overlapping interests in the organic old jazz sounds from the 30’s – 50’s, and also in ukulele playing. Later, Polkadot came up with the idea of a duo sound based on the 1930’s Django Reinhardt style, with her ukulele taking on the rhythmic role of Django’s D-hole acoustic guitar. Things progressed from there. Moonbeam: The name comes from a popular song from the 1940’s: Polkadots and Moonbeams, Frank Sinatra’s first hit with the Tommy Dorsey Orchestra. 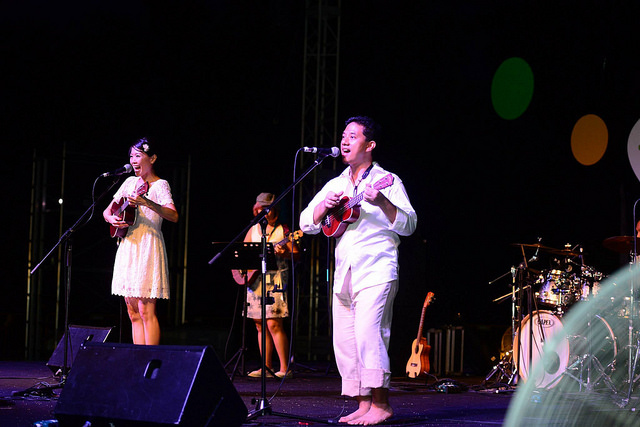 The first time I visited Polkadot in Singapore October 2010, I was attempting to play that song in a ukulele-jazz fingerpicking style. Polkadot heard it, and thought the title of the song was a good name for a duo. We had already played a few gigs together as a duo and were already romantically involved, so us establishing a permanent musical duo was inevitable. When the name materialized, we had not considered any other options. It seemed like the perfect one already! Polkadot: It’s a name that spells lovely things and puts one in a sentimental mood. We hope that our music brings a little loveliness and delight into people’s lives. DDoA: How long have you been playing together? How often do your practice? perform? Moonbeam: Our first ever duo performance was in Sydney in August 2010 at a bar lounge inside a bookstore, so we have been playing together for over four years now. We perform a few times a month, and we ramp up our practices before the shows. Moonbeam: Our repertoire is mainly jazz swing and latin standards from the 30’s to 50’s, mixed in with some originals. Polkadot: It’s an unusual chemistry, between the tiny ukulele and the visually prominent acoustic bass guitar. We sing vocal harmony duets while playing these instruments. Moonbeam: Our performance style is intimate and cozy while also quirky and upbeat. Having said that, we also have had occasional special performances where we beef up our sound with our friends, on bass, drums and trumpet. your philosophy in music and life? Polkadot: Love for our dear ones. And the hope that it touches people and remind them of what truly matters. It is what heals, what draws people to each other, and to the softest parts of their hearts. DDoA: What are the usual venues for your performances? What is an ideal venue for ukulele and bass (or ukulele & melodica)? Polkadot: Outdoor beach types, like the garden-themed events. Quirky unconventional destination weddings, kids’ birthday parties. Moonbeam: Technically and generally speaking, where there is no electricity (i.e. no access to a power point), our instrumentation is ukulele (Moonbeam) and melodica (Polkadot), and where there is electricity, our instrumentation is ukulele (Polkadot) and acoustic bass (Moonbeam). DDoA: Polkadot + Moonbeam has performed in Australia, Japan and China. What were some of the perks and challenges on the road? Polkadot: Performing overseas has been eye opening, a big perk is learning about other cultures, music and lifestyles. Some of the overseas experiences became the stories in our songs. Moonbeam: A big challenge is getting around, as we are self-managed, we are also our own ‘tour managers’. Figuring out directions and transport in different languages can be very tricky. One perk is getting to spend a bit of time with friends who live there, while touring our music. 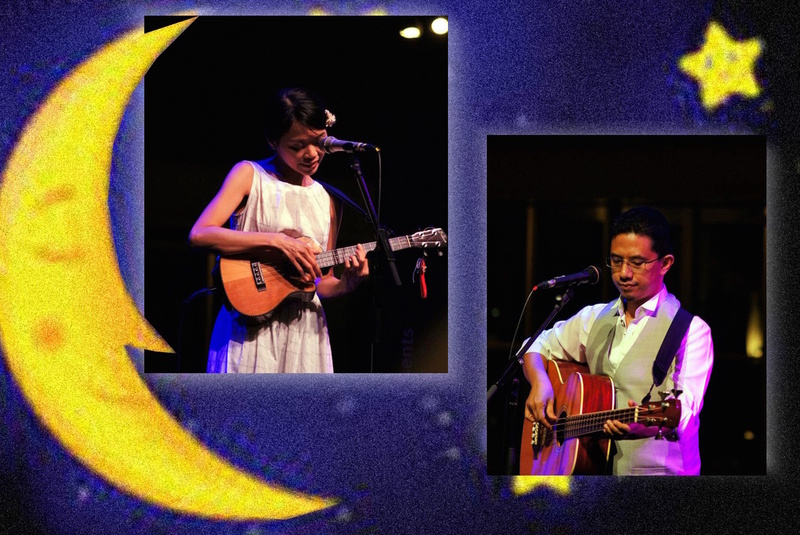 It’s nice to hear them play with other artists too… here is a video of Jazz duo Polkadot + Moonbeam (点点月光) with a breezy tune by Mavis Fan (范晓萱) featuring Daniel Wong on flugelhorn with an original arrangement. Polkadot: The deer at the Nara Deer Park in Japan, lovely things, quaint Kobe and warmhearted but shy Japanese are just some of the beautiful moments we have been blessed to be able to enjoy. But the most significant encounter must have been the one that led to a precious friendship with a couple who has greatly blessed us. We met while playing Shanghai jazz as the resident duo in a Chinese restaurant in Malaysia, and didn’t meet again until a year later when we met in a small church in Perth Australia. But music drew us together, and somehow drew out the stories in our lives. We would have invited them to bless our marriage the same year (2013) but they had a missionary trip planned out at the same time. Moonbeam: We were in China and Japan a few months apart, so we really felt the contrast in the experiences of travelling on long-distance high-speed trains in those two countries. In Japan the passengers are very quiet and orderly, while in China intercity train trips are more lively, with people chatting to each other, talking on their mobile phones and playing video games with the sound up. 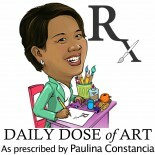 This entry was posted on November 15, 2014 by Paulina Constancia in Bond, Collaborate, Create and tagged Creative Collaborations, music.